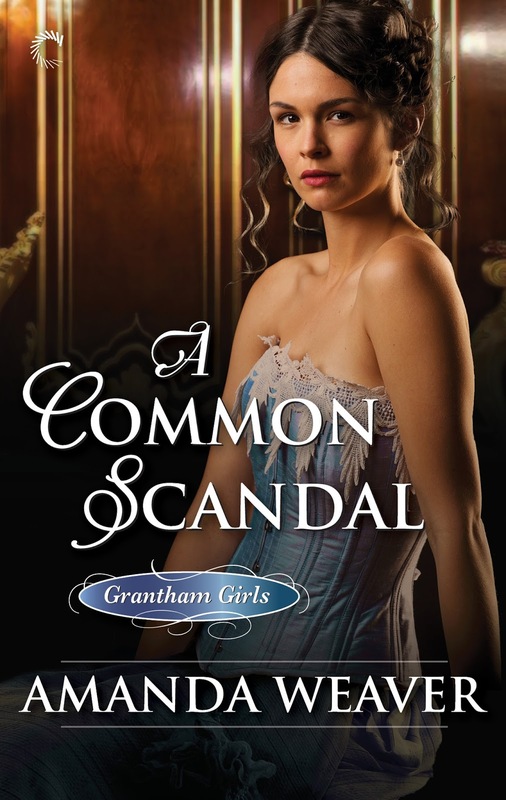 I am so pleased to welcome back Amanda Weaver and her new book, A Common Scandal, the next book in her Grantham Girls series. To celebrate the release of A Common Scandal, Amanda Weaver is hosting a Tour Wide Giveaway for a $30.00 Amazon eGift Card. (Enter via Rafflecopter below). To follow the rest of the tour, click here. Finishing school taught Amelia Wheeler how to put on a well-mannered performance -- when she’s not bored and looking for trouble. Lady Grantham’s is behind her and now it's time for Amelia to keep her promise to her dying mother: marry a title and leave her wild days behind. That promise would be much easier to keep if Nate Smythe hadn’t just reappeared in a London ballroom. The son of an impoverished sailor, Nate -- Natty, as he used to be called -- has grown up to become handsome, rich and polished. He claims to be looking for a proper bride who can advance his business interests, but that doesn’t stop him from seeking out Amelia every chance he gets. Challenging her. Kissing her. Suddenly, struggling against her simmering passion is the least of Amelia's problems -- one of her titled suitors is hiding a desperate secret that could stop Amelia from pleasing her parents or finding happiness with Nate. As a weeklong house party threatens to derail her hard-won future, Amelia must decide: fight against disaster or act like the lady she's promised to become? Despite knowing the sort of marriage she was destined for, she’d resisted making a choice for so long because she’d hoped in time she might encounter a suitable man who sparked some kind of fire in her. But not once, in all her forays into Society, had she met a man who raised more than mild curiosity. She’d read about flaming passions and heated kisses in the lurid, forbidden novels she had traded with Vic and Grace, but her blood had never been stirred by a flesh-and-blood male. She’d begun to think those passions were the invention of novelists and no man could ever make her feel that way. And now one had, and he was hopelessly out of her reach. It was wretched, wanting something she couldn’t have. She didn’t trust herself to look at Natty, knowing her insides would plunge in an unwelcome, delicious way. When he came near her, it was as if her whole body stretched luxuriously and unfurled. Terribly unhelpful, when she was determined to send him packing and behave. The word hung between them for a moment, rife with meaning. He might have only meant she was all grown-up and out in Society, except his eyes made a lightning-fast perusal of her body as he said it, so fast, he was likely unaware he’d done it. In a rush, it broke over her that Natty was aware of her in the same way she was aware of him. Not as an old playmate from his childhood. As a woman. He was as affected as she was, even if he was spending his evening paying court to Julia Harrow. His eyes made their way back to hers and they both held the gaze. This newly discovered knowledge sizzled through her body. Her skin flushed and her breaths grew shallow. Natty’s eyes stared into hers. His lips parted slightly, as if he, too, was baffled by this sudden shift in the air. The atmosphere around them felt charged, the way it did when thunder began rattling the windows and lightning lit the night sky, but still the rain refused to fall. At any minute the clouds could collide and deluge the world, but until then, all the energy of the universe danced on the breeze. She wanted to tease and flirt with him to see how far things would progress. She wanted to see the skies open up. She wanted to be drenched by the rain. Amelia Wheeler and Nate Smythe are childhood friends, who grew up together, but whose lives took different turns when Amelia's father decided to move his family to London, and Nate went to work on a ship. It is many years later, and the height of the London Season, and neither one had dreamed they would cross paths once again. A lot of old feelings resurface when Amelia and Nate meet again for the first time, and a lot of new feelings also start to grow -- they've always loved each other. They've always preferred each other's company over anyone else's -- but, as Nate says at one point: they aren't children any more -- and practical needs and wants supersede personal ones. Amelia is another graduate of Lady Grantham's Finishing School, and, despite "graduating", Amelia never really gained the polished refinement that she needs to survive the London Season. Our heroine is used to the side comments about her (lack of) pedigree, and she's perfectly fine displaying just how unsophisticated she is with her words and her fists -- but Amelia also needs to consider her ailing mother's wishes for her only daughter to marry a title, and, with it, the acceptance of a society that had shunned her when she married "beneath" her. Nate is a self-made man, and he needs to marry a title in order to advance his small shipping business. He's already decided to court Lady Julia Harrow, daughter of the Earl of Hyde, who owns the largest shipping business in England. This is one of two themes that the author tackles in her novel: Amelia wants to please her mother, and Nate wants to gain society's approval. Amelia had little support on the homefront, and she faced a lot of hostility in the battlefront that is the ballroom. While Amelia behaves a bit audaciously, it is not for lack of provocation -- and I felt really bad that she kept getting baited by the other ladies. And Nate had no support. Period. His mother and siblings all died when he was away at sea, and I could see how Nate looked up to the Earl of Hyde, and saw him as a potential mentor/father figure. They knew they could never be together, so they did what they thought was the best course of action, which is to push away and hurt each other. Marriage became a contest between Nate and Amelia, and whoever lands the proposal and the title wins the game -- but it's really a game where both of them would end up as losers, because, whenever they are together, there's this undeniable chemistry and the indisputable knowledge that they really belong with one another. The contest takes both of them to a house party hosted by one Evelyn, the daughter of the Earl of Tewsbury -- Amelia does her best to behave and entertain the attentions of Lord Radwill, while fending off the unwanted attentions of Mr. Cheadle. And Nate is busy getting to know Julia Harrow. The house party is a bit typical with the games and the chances of flirtations, but, it also offered an opportunity for Nate and Amelia to discover that, among the ton, there are people whom they could consider their friends. I have to say that I really liked Julia Harrow's character. I thought she was unique and stood out from all the other ladies. Weaver introduces a bit of mystery with the arrival of Mr. Morley, and Mr. Cheadle's reaction to his "friend's" stay -- and it's a question that you want to get an answer to, so you keep reading. We already knew that Mr. Cheadle was a fortune hunter, but, when the author reveals his motivations ... wow. What makes this childhood friends-to-lovers story stand out is the author's decision to detach the old friendship of Nate and Amelia with their new relationship. The author doesn't rely entirely on old memories and old feelings to fuel the desire between the two -- but, instead, Amelia shows Nate how much she has matured and grown, and Nate shows Amelia how confident and resolute he has become. How can you not admire someone who has worked so hard to get to where he is right now? Disclosure: I received this ARC from Netgalley for this blog tour. Thank you to Amanda Weaver and Carina Press for the opportunity. Yes, this is an honest review. 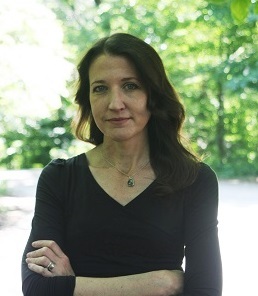 Amanda Weaver has loved romance since she read that very first Kathleen E. Woodiwiss novel at fifteen. After a long detour into a career as a costume designer in theatre, she’s found her way back to romance, this time as a writer. Lovely review. Thank you for hosting A COMMON SCANDAL today!